Villagers who gathered to celebrate the life of one of the most popular people in their community were able to toast him with a beer named in his honour. 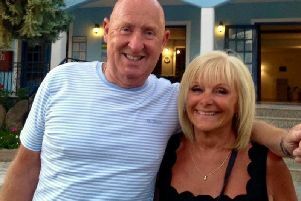 The Worsthorne Brewing Company came up with the touching idea as a final tribute for Steven Hodgson, who has died from cancer at the age of 57. He was affectionately known as a "Hodgy" in Worsthorne where he was one of the best known and loved characters in the village. As he enjoyed socialising in all the pubs in the village and loved a pint the brewery came up with the idea for the beer named after him. Sir Hodgy's Tipple, which was the cask ale Some Like It Blonde, was on sale at the wake held at Burnley Football Club after the funeral at St John's Church in Worsthorne. And all the proceeds from the sale will be donated to a charity chosen by the family and friends of Hodgy. Robert Hockedy of the Worsthorne Brewing Company said: "We were really sad to hear about Hodgy's death. "He was well known to myself and my father-in-law, Michael Whittaker, who owns the brewery, as he had worked for us in the past." A big Burnley fan, Hodgy achieved one of his dying wishes to meet manager Sean Dyche and the image of the two of them together featured on the beer's badge. Hodgy was often referred to as "Mr Worsthorne" and was even given the official title of Sir Hodgy of Worsthorne in a special ceremony conducted by former Burnley manager Stan Ternent. Originally from Harle Syke, Hodgy went to Haggate Primary in Burnley and the former Mansfield High schools in Nelson. He moved to Worsthorne in 1991 with his late mother, Margaret, and soon became part of the community he grew to love. Hodgy worked at a variety of companies, including Lupton and Place, Burnley, during his working life. For the past 10 years he was Worsthorne’s handyman, undertaking a variety of jobs for residents, from grass cutting and painting to building and labouring. Hodgy went to every Clarets game and out of the 92 clubs in the premier and football leagues he had visited 78. In his last months friends, including Gavin Fernavs, Leo Catlow, Diane Green and Julie Smith, honoured Hodgy’s wishes to stay in his own home by taking care of him themselves. He leaves a brother Gary, sister-in-law Pat and nieces and nephews. Donations in Hodgy’s memory are being received for Macmillan Cancer Support c/o Alderson and Horan Funeral Services, 128, Rossendale Road, Burnley.